The Uninterrupted Power Supply in an IC . Cymbet Corporation announced the availability of the EnerChip™ CC CBC3105 smart solid state battery. The CBC3105 combines the award winning EnerChip battery with integrated input power conversion, battery management and regulated output capabilities. The Cymbet EnerChip™ CC is a smart rechargeable solid state battery Uninterrupted Power Supply (UPS in a Chip™) that provides power backup to microelectronic devices when main power fails. The EnerChip CC provides power supply monitoring and switches over to the internal solid state backup battery when the supply drops below a set threshold. The EnerChip CC product family can provide anywhere from several hours to several weeks of backup time. The CBC3105 is an ideal solution for design engineers who need a compact device to back-up a Real Time Clock or Microcontroller during power failure where coin cell batteries or super caps will not work due to size, reliability, no battery doors, no battery replacement, battery disposal issues, or need for life-of-product power. The CBC3105 uses surface mount/reflow solder assembly and is RoHS tested-compliant. The EnerChip CC device family can accomplish all this in a footprint as small as the CBC3105 4mm x 5mm x 0.9mm package that is priced as low as $0.50 in high volumes. The EnerChip CC CBC3112 and CBC3150 provide even more energy storage in similar small footprint packages. The CBC3105 can be purchased at Avnet, Avnet Abacus, Avnet Asia, Digi-Key, Mouser and Farnell. CBC-EVAL-05 EnerChip CC Evaluation Kit which contains everything needed to test EnerChip 12uAh and 50uAh thin film batteries, EnerChip CC CBC3112 and CBC3150 batteries with Integrated Battery Management, and to test multiple batteries in parallel. This kit will also include a CBC3105 evaluation board for experimenting with this device. 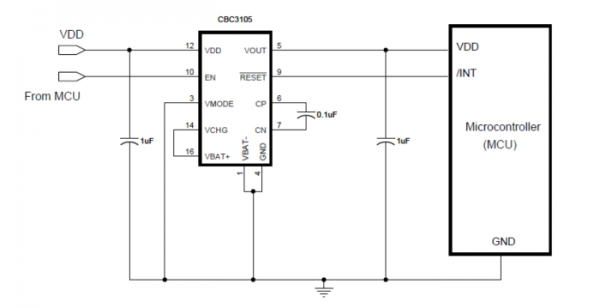 CBC-EVAL-06 Real-Time-Clock Evaluation Kit: includes a Microcrystal NV2123 Real-Time Clock device and a CBC3112 EnerChip CC for battery backup. This kit also includes a Windows based Graphical User Interface to set the clock & test operation in RTC back up and count-down modes. At booth 2330 at Design West/ESC 2012 at the San Jose Convention Center March 27-29, 2012, Cymbet will demonstrate tiny footprint power backup solutions that give designers the ability to create optimized products. By providing all the functions of a UPS system in a single chip, the EnerChip CC batteries enable a new class of products that utilize life-of-product energy storage.